On a beautiful afternoon, I ran to Firle Beacon. There are now poppies, a great red swathe on one hillside. I felt tired. A very enjoyable run with the Mayfield House running team. A run to Splash Point in strong winds after a day off yesterday. 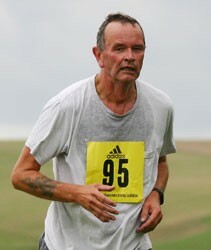 Looking at my statistics and referrers, some people have found this site googling for the results of the Seaford 10k. I'm waiting too, as I only have an approximate idea of my time. In the Runners World forum for the event, Chocolate Moose said "I think the chap who does the Striders' website is on holiday, so it might be a few days before the results go online. But if you write to the race secretary (I think the address was on the entry form) I expect they'll be able to send you a copy." I took myself inland, in a strong wind with some sunny intervals, on the Frog Firle route. Flax shades some of the fields blue, and in the hedgerows wild roses flower, as do elderflower and honeysuckle, whose tendrils reach everywhere. I did an easy thirty minutes to the sea and back; actually it didn't feel that easy. The Forerunner was charged once more. Today, being Father's Day, I ran the Seaford 10 K. It was very agreeable, well organised on a nice route starting at my childrens' school, going round Chyngton, bits of Seaford Head and the Cuckmere valley, with two moderately hard hills. The battery on the Forerunner gave up, so I had no idea of pace or time, but I must have been doing fairly well, as the people just behind me did 49 minutes something. I await the official results. An enjoyable run with BSMS colleagues, on the long route, and with all of them (Claire, Jana, and Steffi) the full set as they are all restored to fitness.